The 4th seeded Rebelles from Louis Riel were the NCSSA representative and they left Peterborough with a silver medal. The Rebelles had a strong first day finishing first in their pool with a perfect 4-0 record. A strong day two pitted the ladies from Gloucester against the hosts from Lakefield District Secondary School in a quarter final match up. The Rebelles won the quarterfinal 3-1 (25-9, 25-14, 25-27 and 25-12) in what was considered a lopsided match against the hosts. In the semi final the Rebelles faced E.C. Saint-Charles Garnier (LOSSA) representative, (the second seeded team), who just knocked off the top seeded team in the quarter final and won 3-0 (25-17, 25-20 and 25-14). They Rebelles were to meet the third seeded team from Greenwood College in the final. Unfortunately, the Rebelles were unable to claim victory and lost 3-0. Congratulations to the Rebelles on their silver medal performance. Current and/or former Maverick athletes on the team are: Isabelle Amyot, Claudia Besner, Natasha Cloutier and Sophie Nadeau. One can’t mention Louis Riel volleyball and not name Frank St. Denis. Frank guided the team to their third medal in the past four years (two back to back OFSAA “AAA” golds and now OFSAA “A” silver). Ottawa hosted this tournament and almost swept the medals as all three Ottawa representatives played in the semi final matches. The Samuel Genest Lasers were making their appearance at OFSAA with a core group of athletes who were in grade 11 or younger so one could say that this OFSAA was to gain experience. This team could have easily won the tournament with the talent that they had and impressed all with their play. In pool play they finished 3-1 with a tough three set loss to Lockerby but in the quarter final the Lasers sent a message to the competition that they would be challenging for the title as they handed Essex a 3-0 loss (25-22, 25-8 and 25-11). This was significant as Essex had beaten the two-time defending champion and number one seeded Gisele Lalonde in pool play the previous day. In the semi final the Lasers met General Amherst and won the first set but as the match progressed they were unable to beat the Amherst falling 1-3 (25-23, 21-25, 18-25 and 11-25). If the Lasers were looking for OFSAA experience they were to get it as they would face De La Salle in an all Ottawa bronze medal match. The Laser fought hard but fell to the Cavaliers in 3. Current and former Maverick athletes on the team are: Sarah Piana, Laura Hanrahan and Emilie Ryan Estephan. The team is coached by Eric Germain, who had previously coached in the Club. The De La Salle Cavaliers wanted nothing more than to host and win the championship. This team had the talent to win it all but unfortunately met a more experienced team in Gisele Lalonde in the semi final who were focused on claiming their third title in a row. The Cavaliers finished pool play with a perfect record of 4-0 and not having dropped a set. In the quarter final against Lo Ellen the De La Salle team pushed through and won 3-0 (25-13, 25-11 and 25-18). With that quarter final win that unfortunately pitted two Ottawa area teams into the semi final. The Cavaliers had their work cut out for them as they were going to face the Gisele Lalonde Titans. The Cavaliers came out strong and won the first set however the Titans fought their way back and won the next three sets to win 3-1. The Cavaliers knew that they had to rebound back quickly as their bronze medal match against the Samuel Genest Laser was going to be a tough match. 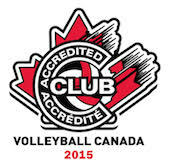 The Cavaliers fought hard and won the bronze medal 3-0 by scores of 25-19, 25-19 and 25-13. Current and former Maverick athletes on the team are: Samantha Simpson, Miriam Grenon, Delaney Orr, Emika Marinnaci and Kaly Soro. The team’s assistant coach was Emily Goyette who is an alumnus of the Club. The Gisele Lalonde Titans entered the tournament as the number one seed and as two time defending champion at the “AA” level. They had a target on their backs and with the exception of a minor blemish is pool play were dominant on their way to their third consecutive gold medal. Gisele finished pool play with a 3-1 record as they lost in the third set to Essex, however they quickly rebounded and knocked out Lockerby 3-1 in the quarter final (26-28, 25-11, 25-16 and 25-22). The win over Lockerby made semi final number one an all Ottawa match up as Gisele would play De La Salle. The Titans lost the first set to the host Cavaliers but was able to win the next three sets on their way to the 3-1 match win (21-25, 25-19, 25-14 and 25-18). In the final the Titans let it be known that they wanted the three-peat and came out strong and did no look back on their way to a convincing 3-0 win over General Amherst (25-22, 25-13 and 25-20). Although a relatively “new” school the Titans are showing that they are a volleyball powerhouse and the streak of a four-peat is possible given the young talent that they have on their current roster. Current and/or former Maverick athletes on the team are: Catherine Loranger, Devon Von Eicken Bursey (grade 11), Jessica Bolduc, Cian Canci, Elyse Patry (grade 10), Emie Gaboury (grade 9) and their undoubted leaders Sabrina Roy (grade 11) and Rebecca Roy. The team is coached by Marcel Martin, his daughter; Ana Martin (Mavs’12) was on the team for the first and second gold medals. Marcel’s assistant coach is Sheila Roy who is also the current assistant coach of the Maverick Shotguns. Bravo and congratulations on the third championship tile. The National Capital was represented by the Franco Cite Faucons at this championship. The Faucons were a perfect 3-0 in pool play and played a quarter final against Havergal were they won 3-1 (25-16, 21-25, 25-15 and 29-27). In the semi final Franco Cite met a strong Waterdown team and lost in three straight by scores of 17-25, 28-30 and 23-25. All close matches and a valiant effort by the Faucons. The Faucons bounced back and won the bronze with a convincing three set win over Iona by the scores of 25-15, 25-16 and 25-12. Current and former Maverick athletes on the team are: Christine Beaudoin, Kyra Fernandes, Audrey Duvnjak, Marianne Sauriol, Emilie Parker and Fiona McGuinty. The team is coached by Pascal Lacriox, who coaches in our Young Mavs program and by Thierry Lavigne who is currently coaching the Maverick Broncos. Last but not least the Glebe C.I represented the National Capital Region at the “AAAA” championship where the team finished with the antique bronze medal. At the time of the writing of this article the playoff results had not yet been posted. This is one of the best results in recent memory for a team from Ottawa at the quad A level. Great job ladies! Current and former Maverick athletes on the team are: Evelyn Yang and Valerie Bian.